Its quite a poor upgrade visually- more focus has been put on the 8 million adverts than the forum. The font is quite poor (for quotes etc also) and the colours are quite insipid. When you first go onto the site, its similar to the advert deluge of the Herald online stories. The addition of the table and fixtures is good, but the visual impact of the site seems to be putting a lot of users off (quite a few seem to be using the old site version on their mobiles). Freechat is the biggest collection of Argyle fans on the internet- with the latest pasoti downgrade, I can only see freechat's popularity increasing. Isn't the Football League notoriously stringent in it's copyright of the fixtures list? Be a bit more helpful if the fixture dates were correct. On my screen, I have Argyle playing on a friday, Thursday and Sunday. Also... The great irony is that a lot of the reason for Nool changing Pasoti is so he could have a 'thumbs up" feature, which of course, is not functional at the moment. There is a long list of problems. Clearly many prefer the old version. Another walking talking Nool disaster... So, what was improved, anything? Looks like any old generic forum now. Nothing unique about it at all. The day that Evil forum ceases to exist will be the day I rejoice. Its continuing reliance on dodgy sponsorship should hopefully bring that day sooner rather then later. Newells past just won't leave him alone will it? 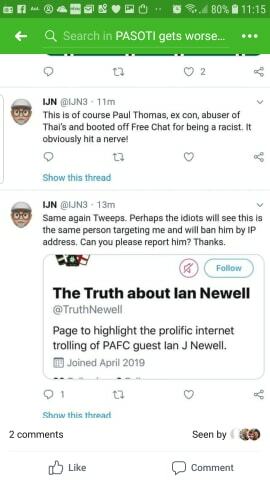 Those tweets from the Paul Thomas fake account are surely evidence to anyone the guy is a troll himself. Just like when he was too thick to realise his flickr was set to public he was too thick to realise he'd posted from the wrong Twitter account. In fact Newell heres an offer even you will appreciate. £10,000 cheque payable to Argyle Ladies team if any evidence of me manaufacturing twitter accounts come to surface against you. Just visited the farm to see if we're playing as badly as bbc implies. The revamp is a absolute disaster - acres of space for each post and why is a quote at least 10 times the size of a reply? Not if the 'natives' can complain about it either. The Porkstain will ensure they have log in issues no doubt. The new layout on the Pasoti/Nooloti Forum is shockingly bad who the fvck came up with that mess ? Just have a photo of King Nool sat on a throne wearing a crown, nothing to fancy. HAHAHA. The new pasoti looks a right bag of shite. The avatars are now round why FFS coz most pics used are rectangle. Like others have said spacing looks all wrong to much space. The avatar/username box is way to big. The janner banners have been cut and paste from the old shite. Looks shite. The header of the main page has been cut and paste from the old site. again still looks shite. The whole thing looks like a right half arsed cut and shut job just to save a few quid. It all looks like the only thing the site owner is interested in is making money from adverts. If you are going to design a new website do the whole thing not just a bit of it using old bits from the previous site. I could carry on but can't be arsed. Macey is currently man of the match against Doncaster. Did any of them go????? Doubt it, Posteys polls are living proof that Nool has banned more people from pasoti than are allowed to post there now. The result is that Posteys polls are always a complete feckin joke. Not to mention the highly dubious auctions where posters you've never heard off suddenly spring in out of nowhere and start bidding against each other to by Newell's cheap and nasty tat. PASOTI ran by Oafs, sponsored by cowboy builders,bent solicitors,dodgy estate agents,crooked accountants and supported by ageing dribblers and pre pubescent ratbags like Ollie eager to be someone at the theatre of schemes.